The Osborn climbing frame from Selwood is designed with small to medium sized gardens as it includes the popular space saving accessory, a combined monkey bar swing beam. The Osborn also features other fun accessories such as a picnic bar, a slide, a rockwall ladder and a play fort with an upper and lower playhouse. 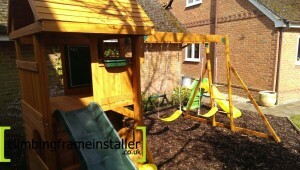 The Osborn climbing frame is similar to other playsets in the Selwood range including the Penshurst climbing frame, the Croft, the Molton, the Myers, the Sherborn, the Perth climbing frame for small gardens and more, most of which also include the popular combined monk ey bar swing module. Although Selwood climbing frame are designed with self-assembly in mind, it may be more convenient or quicker to have your playset installed by professionals. Our certified climbing frame installers are experienced in assembling children’s play frames from most manufacturers including Selwood. 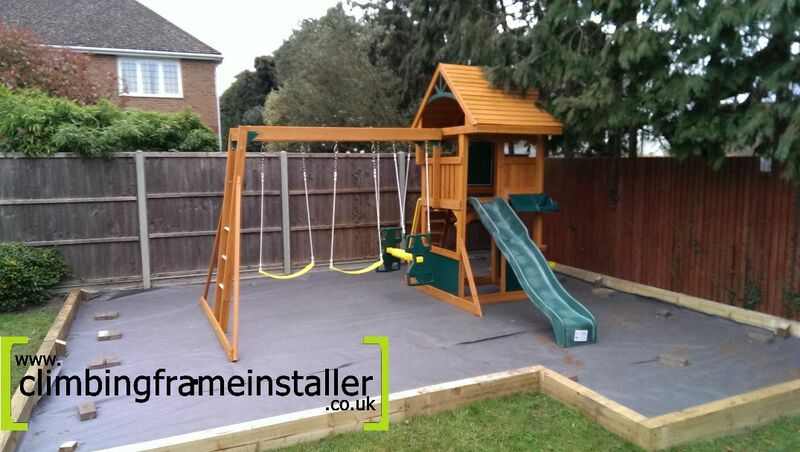 Our team of playset builders specialise in the safe installation of outdoor climbing frames so you can be confident yours will be safe to play on and built in no time. The Osborn playset is a relatively compact cute looking playset which looks great in any garden and will provide your children with hours of outdoor fun. 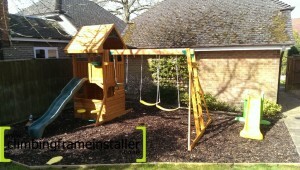 The Osborn play frame features a wooden play fort with an upper and lower play cabin for kids to play in. The upper playhouse is supported by the wooden play deck which is roughly 1.5m high. The play tower is sheltered by its own wooden roof which keeps the play deck reasonably sheltered from precipitation and direct sunlight on hot summer’s days. 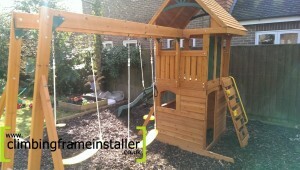 The raised play deck is enclosed around the outside by wooden railings and a solid half wall at the front and back of the playset. The enclosed play cabin will keep little ones safe while p laying and the upper playhouse even includes a chalk board on the back wall which kids can get creative on. Kids can use the rockwall ladder at the back of the playset to climb to the play deck which combines tow accessories together in the space of one, much like the monkey bar swing beam. 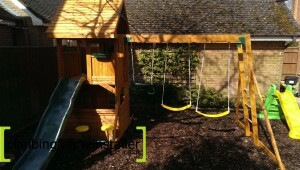 These additions are what makes the Osborn a fun packed climbing frame that is still suitable for smaller gardens. The rockwall is a popular accessory as it caters for different ages and abilities with the rockwall being a more challenging climb but the steps can be used for less confident climbers to reach the play deck safely too. Beneath the play deck is the second play cabin which is enclosed around the outside so kids have a fairly spacious play den to store toys in etc. 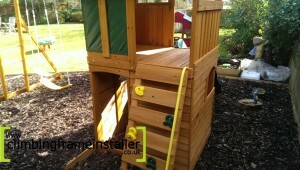 Both the raised playhouse and the lower one have a good amount of space so a group of children can play together on the Osborn playset at any one time. 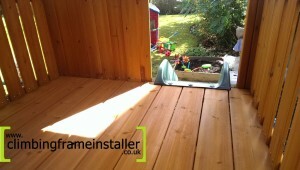 The lower play cabin includes an opening at the back of the climbing frame to be used as an entrance and exit to the play den. It also includes a window at the front which doubles up as a picnic bar as there are two picnic stools on the outside of the playhouse at the front of the climbing frame. The picnic area is a nice accessory as it provides a seated area for children to sit at and have a drink or snack plus it also inspires games such as shops, cafes and restaurants too. The monkey bar swing beam at the side of the play frame is featured in many of the climbing frames in the Selwood range. The Swing beam in the Osborn features three swing seats, a trapeze bar and two single belt swings. The single swings included within Selwood swing sets are designed to grip children’s hips and help them to stay s afely balanced while swinging. The trapeze bar is a fun alternative that older children will like. The slide at the front of the play tower in the Osborn climbing frame is also a popular accessory which provides children with a fun way to exit the play deck. The slide is moulded with high edges particularly near the top to help prevent tumbles and keep little ones safely on the right track to the bottom of the slide. Climbing frames are a fun way for children to get plenty of exercise and stay fit and active at the same time as being amused for hours in the garden. 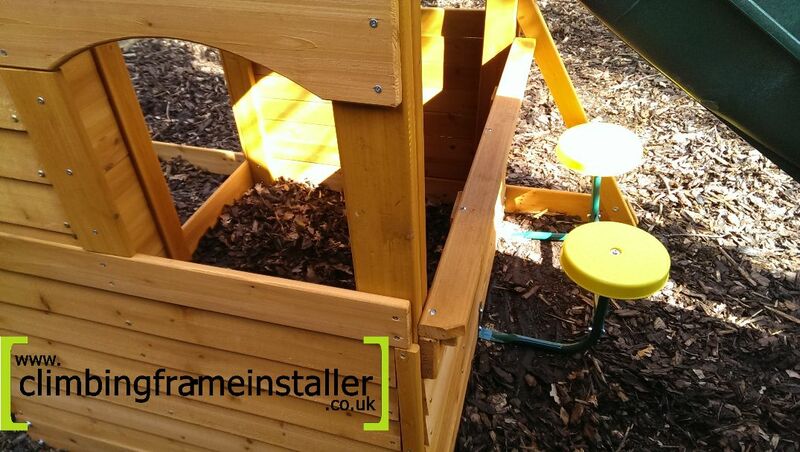 An outdoor play frame will keep the kids amused in the garden so they’re not under your feet and they are a brilliant investment for the whole family. For help with installing your playset contact the climbing frame installers now. Our experienced team of playset builders specialise in the safe assembly and installation of outdoor climbing frames so you can be sure yours is safe for children to play on. Call us now for a quote on 07792309588 or email: [email protected].